First published in 1984 and reissued by NYRB Classics in 2013, William McPherson’s excellent first novel Testing the Current harks back to a bygone age. Set in the late 1930s in a small town in Michigan near the Canadian border, the novel focuses on one year in the life of eight-year-old Tommy MacAllister. Each summer, Tommy’s family and their financially-comfortable WASP friends retreat to a group of small islands in the river that runs by their town, where their days centre on rounds of golf at the country club, dinners, dances and other social engagements. There were tears in her eyes, too. Tommy thought, when she bent to kiss him, and tuck the blankets around him so he’d be snug and warm in the frozen middle of the first night of the New Year. The cold heavy clips she wore in the neck of her dress brushed against him as her soft lips touched his own soft cheek. Tommy hugged his mother tightly to him. Alongside its primary theme, Testing the Current also touches on other issues of the time. Although never to the fore, the relatively recent Depression is there in the background, and while Tommy’s father has done well to profit in recent years, other members of his family are down-at-heel. Racial tensions occasionally flare as Native Indians serve the island and WASP community. I chose this section as it also highlights how Tommy’s relationship with his father differs to that with his mother. While Tommy enjoys a close and loving bond with his mother, that closeness isn’t quite reciprocated in his relationship with his father. At one point, Tommy reflects how his father could be so nice one minute but end up saying something mean the next. Testing the Current is a quietly compelling slow-burner. It’s beautifully written, and its focus on Tommy and his family’s day-to-day lives reminds me (once again) of John Williams’ Stoner, a remarkable book that gives us the story of a man’s seemingly less than remarkable life. There are similarities, too, with Wallace Stegner’s Crossing to Safety, although McPherson’s prose feels more matter-of-fact — and appropriately so considering his focus is the life of an eight-year-old-boy — than Stegner’s . 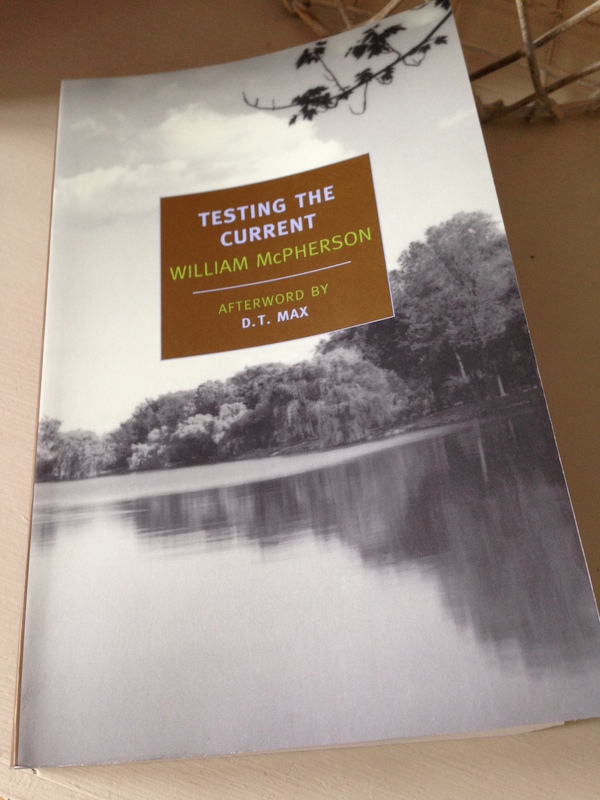 Testing the Current is published in the UK by NYRB Classics. Source: personal copy. This entry was posted in Book Reviews, McPherson William and tagged Book Review, Fiction, NYRB Classics, US, William McPherson on September 22, 2014 by JacquiWine.